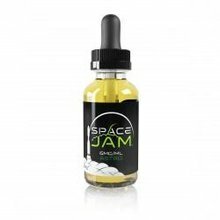 Space Jam E-Liquid may be the new star in the solar system that is e-liquid, but it's already considered by many to be among the highest quality vape juice available. We at SouthSmoke.com are of the opinion that everyone needs to try Space Jam e liquid at least once in their lifetime. We carry the full range of Space Jam e liquid products, so whether you're vaping at home, on the go, or even among the stars, Space Jam vape juice gives you the kind of flavor you've been looking for. Hookah enthusiasts, your search among the stars for the wildest e-liquid on the planet is at an end! Space Jam has traveled across the galaxy to bring you the most out-there hookah flavors. Here is the full lists of Space Jam flavor list for you to browse. Unlike other hookah flavors, Space Jam really goes for it when it comes to offering you unique tastes. Not content to simply mix two well-known flavors together, flavors such as Space Jam Pluto combine several tastes together to create something truly extraordinary. Space Jam Astro e juice is another mind-blowing flavor that seems so simple you?ll wonder how it didn't catch on sooner! We at SouthSmoke.com offer you a complete variety of tobacco-free, tar-free Space Jam liquid. Additionally, all Space Jam e juice is available in nicotine-free 15ml bottles, but if you?re looking for a bit of extra buzz, we also carry 15ml Space Jam bottles in a 3mg and 6mg nicotine size. Simply add these to your e-hookah for what can only be described as a "starry rush!? If you're up for a truly unique e-hookah experience, you could do no better than Space Jam. If you aren't sold by the Space Jam flavor descriptions above, then we urge you to order one and see for yourself how they taste. Describing them with words is one thing, but actually tasting them is a completely different experience! These 15ml bottles are low on price but big on flavor, which is perfect for ordering Space Jam e liquid wholesale or individually. Order today!